Kirsti Abbott is an ant ecologist at the University of New England and she loves ants. Her work has taken her to islands in the Pacific including Christmas Island, Indian Ocean, and Tokelau in the Pacific to research how swarms of yellow crazy ants are able to gain a stronghold and create super colonies. In this talk she introduces us to carpets of yellow crazy ants while examining our connection with the oft ignored little things underfoot everyday. Kirsti is an avid ant ecologist and science communicator with a passion for inspiring younger generations to connect with their inner insect lover. 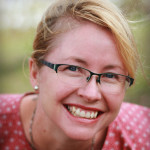 She leads the UNE Discovery program at University of New England, where she develops transformative outreach & engagement experiences for students and communities in northern NSW. Kirsti also runs School of Ants, a citizen science project that you can get involved in yourself, helping understanding the diversity, distribution and diet of Australian ants in our urban landscapes.